At the 2015 International Conference National Trust held in Cambridge, UK the Africa Regional Forum was established, the NTZ is a full time member and holds the current Chair. A vibrant network of African Heritage Organisations, who are active in protecting and promoting the Continent’s Cultural Heritage. 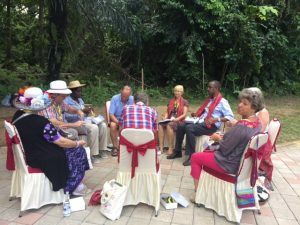 The INTO Africa Group brings together like-minded National Trusts and Heritage Organisations, from across the Continent to share ideas and resources and to develop a Continent wide voice and influence on heritage matters. The Group will concern itself with the conservation of natural heritage, intangible and tangible cultural heritage including architectural heritage.  To create a globally influential group of interested African parties for action on heritage matters within and outside of INTO and, where possible, to act as a group in unison, on matters of mutual interest. The NTZ responded to a call for proposals to host the Inaugural Pan Africa Forum Conference and we are proud to announce that we won! The NTZ is looking forward to hosting conference which will result in a powerful network for NTZ and significantly raise the profile of NTZ and of Zimbabwe and assist in future heritage project funding opportunities locally and regionally.